Stereo Enhancer, Surround Sound/Spatialization Software from Oli Larkin. 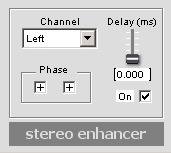 The Oli Larkin Stereo Enhancer is a really simple and free plug-in for Windows operating systems and VST based DAW platforms. It's the simplest of the free plug-ins that Oli Larkin has to offer, which are definitely worth checking it out in general since they're all free. You can get everything straight from the Oli Larkin website. I'm not sure what year these plug-ins were made, but I had them a few years ago on my old PC system. After you download and install the plug-in, which is a quick and easy process, the interface is going to be easy to figure out as well. The only things you can really do with the plug-in is reverse the phase on either the left or right channel as well offset either of them with a bit of delay that ranges up to 50 ms. It really couldn't be simpler to use, and I don't think there's a manual for it anyway. 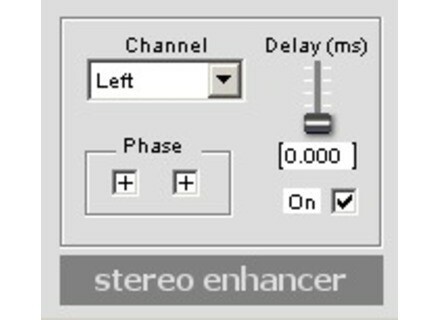 I'm not running the Oli Larkin Stereo Enhancer plug-in on my current system since it's not compatible on Mac. When I did run it, it was in Cubase SX 2.0 and 3 and on a Hewlett Packard Pavilion dv8000 lap top with a 3.0 Ghz processor and 2 GB of RAM. I never had any problems at all running this plug-in as far as performance goes, as it really takes up the least amount of processing power possible. While not anything too revolutionary, the Oli Larkin Stereo Enhancer is still a free tool worth checking into if you have a compatible system and might need something like this. It's definitely not the most effect stereo enhancer since there isn't all that much that can be done with it, but it's still good at what it's able to to. I probably wouldn't use it for anything professional, but if you had a rough mix and you wanted to have a little more separation on it, this would be an okay way to do so. If you're running a PC that can only run VST plug-ins, chances are you don't have the most professional set up (no offense! ), so this plug-in and the other Oli Larkin plugs would be good free tools to have around.